This discussion provides guidance for the design of pipelines. 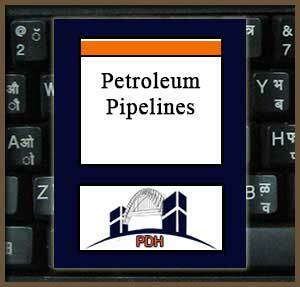 Pipelines are typically either interterminal pipelines which are cross country and connect installations, or installation pipelines which connect petroleum-oil-lubricants (POL) facilities within an installation. The primary differences are that interterminal pipelines cross public and private properties, streets, highways, railroads, and utility rights-of-way, whereas installation pipelines do not. Interterminal pipelines may be dedicated lines connecting two or more facilities or privately owned common carrier lines serving several shippers. In some cases, the shipping facility may consist of a relatively short spur which delivers the fuel to the suction side of a pumping station which is part of the main line of a larger pipeline system. Pipeline receiving and dispensing facilities are normally part of a bulk fuel storage facility. This course is intended for mechanical and petroleum engineers, and other design and construction professionals wanting an introduction to piping and ground facility systems for petroleum fuel handling. This course will give engineers and others an introduction to piping systems for petroleum fuel handling applications. This is an introduction to piping systems for pipeline and ground fueling petroleum fuel handling systems. After completion of this course you will have an understanding of equipment and methods employed in pipeline and ground fueling petroleum fuels piping systems.